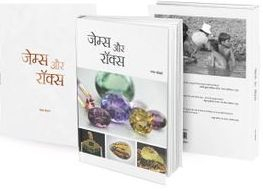 The author at the Gem Testing Laboratory of Jaipur, India, regularly receives some unusual and interesting materials for identification, some of which have been discussed in past issues of Gems & Jewellery (see ‘A different kind of composite’, Spring 2010, p.10-12 and ‘Another interesting composite — diamonds and rock crystal’, Autumn 2010, p. 20-21). 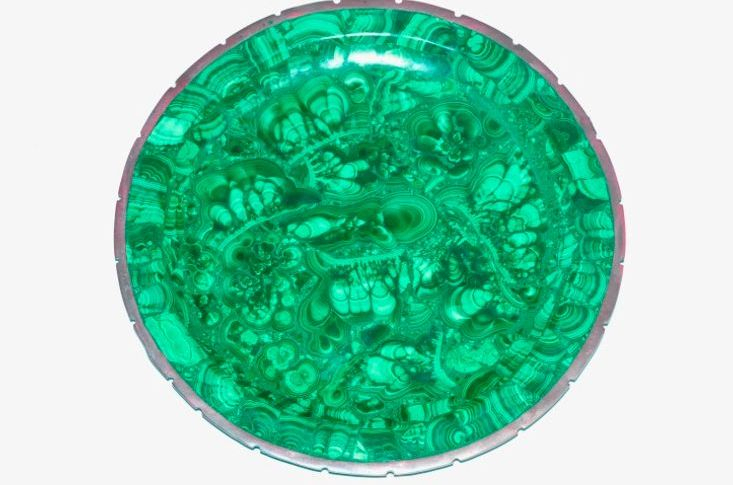 Recently, numerous types of composites were encountered which are new to the trade, and at the beginning of 2011 an attractive circular plate was received which consists mainly of malachite (figure 1). Subsequent to certification, the depositor showed us two more pieces of this material (figure 2), and it is these three items on which this account focuses. Figure 1: This plate weighing approximately 958 g proved to be made up of small fragments of malachite bonded or cemented together. Figure 2: Two more plates of the same material as the round plate (figure 1). The owner revealed that they had been manufactured in Africa. The circular plate (figure 1) weighed approximately 958 g and measured 27 cm in diameter (see again figure 1 and figure 2, left). The other plates were oval and fancy shaped. The oval and round plates were coated with a metallic layer at their rims. This metallic rim was too thick to be simply paint and appeared to be a foil or sheet of some brassy metal. All three plates were green with banded patterns in light and dark green; the colour and appearance were distinct enough to identify these plates as mainly malachite. The oval plate had a figure of a bird at its centre (figure 2 and 3) which consists of white and black components. The black areas also contained some minute white crystals, visible to the unaided eye (figure 3) which prompted us to look in more detail under the microscope. It was impossible to identify the black and white areas however with the equipment available. 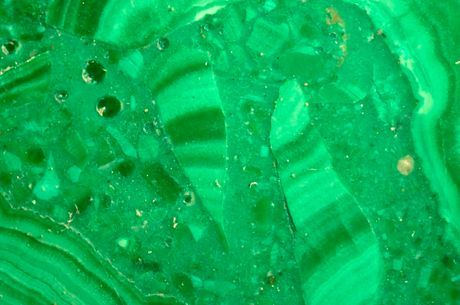 When magnified, malachite’s distinctive banded pattern and botryoidal structure was seen to consist of radiating minute elongated crystals (figure 4). In some areas, this botryoidal banding terminated at uneven boundaries. Between two large areas of botryoidal banding some randomly oriented minute crystals were visible along with hemi-spherical pits (figure 4 and 5). 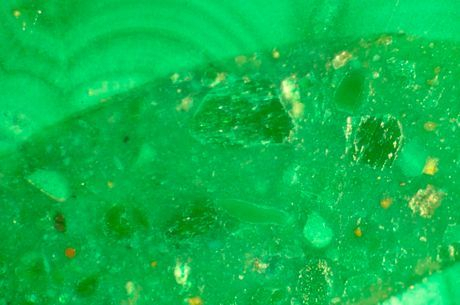 These pits were indicative of gas bubbles which have been intersected during the process of cutting and polishing, and had originally been trapped in a polymer used to bind the individual pieces of malachite. Similar features were visible all over the plate (figure 6), which also contained some areas of straight banding with minute elongated crystals oriented perpendicular to the direction of banding. Such structure is associated with many polycrystalline materials such as malachite or chalcedony. However, in nearby areas, large hemispherical pits/cavities were present, along with some randomly oriented crystals (figure 7). 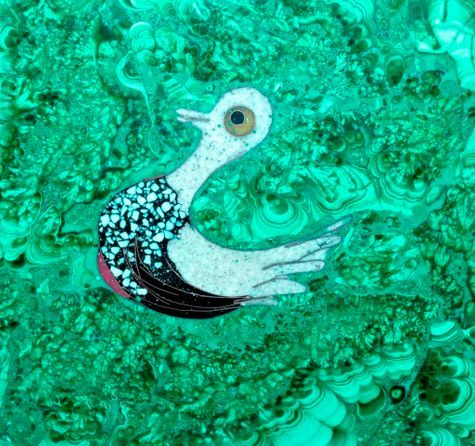 Figure 3: The oval-shaped plate had an image of a bird at its centre with portions of white and black; the latter contained small white crystals, visible to the unaided eye. 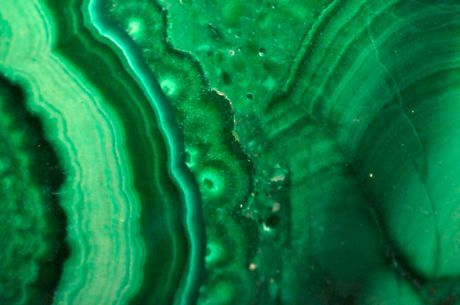 Figure 4: This distinctive banded pattern displaying botryoidal structure and radiating minute elongated crystals is typical of malachite. Note the area between two large portions of curved wavy bands (centre, top) which displays tiny randomly oriented crystals along with hemispherical cavities; these are the location of gas bubbles intersected during polishing. Magnified 25x. Figure 6: Areas containing smaller crystals with botryoidal banding and gas bubbles. Magnified 30x. 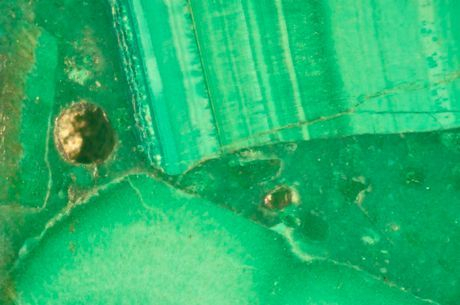 Figure 5: Detail of the boundary of a malachite fragment where the banding ceases abruptly against a large patch of minute randomly oriented crystals of malachite. Such features are indicative of a composite nature. Magnified 45x. The composite nature of the plate and the other items was not hard to establish and with careful examination using a 10x loupe and a light source, the presence of bubbles in the cement can be detected. On discussion with the owner of these plates it was revealed that they had been supplied from Africa, but the exact location was confidential. He said that balls and spheres were also being manufactured in addition to plates. 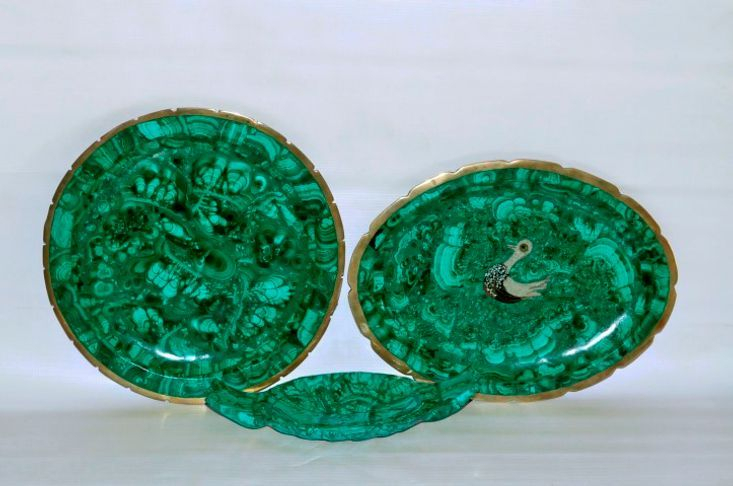 These plates made from bonded malachite are interesting materials for collectors as well as others, but their composite nature should always be kept in mind if repair or cleaning is required. Meenu Brijesh B. Vyas for bringing the material to the author’s notice. Abhinav Jhalani and Ankit Jasoria (owner of the samples) for providing additional information.